The Honourable Diana Whalen, Nova Scotia FInance Minister making her opening remarks at the January 21st public input session for the NS Tax Review in Halifax. 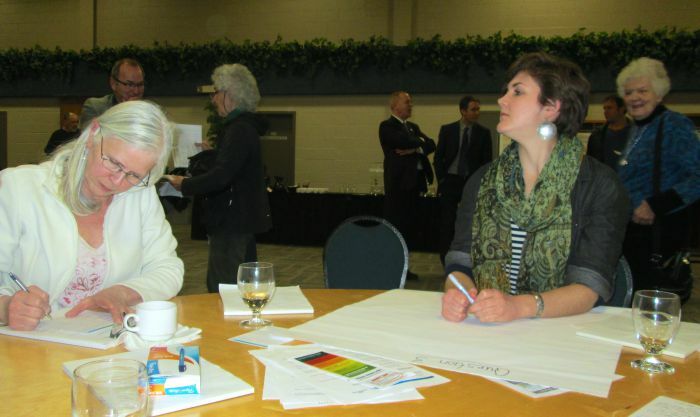 Two of four generations of concerned Nova Scotian citizens produce dozens of points in group sessions. 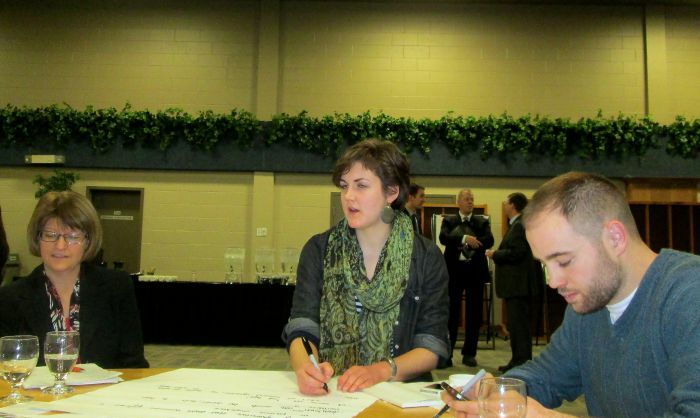 Citizens show overwhelming support for carbon pricing for Nova Scotia to combat global warming. Gender, generation and hair varieties come together to debate and discuss tax reform. 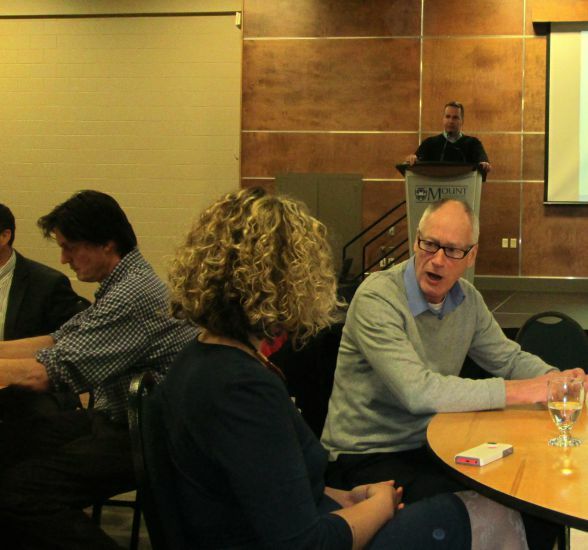 Finance minister sits in on various group discussions to add points and listen to citizens' concerns. Citizens representing many lobbies compare, clash and cooperate in round table format brainstorming to answer the government's three questions posed. 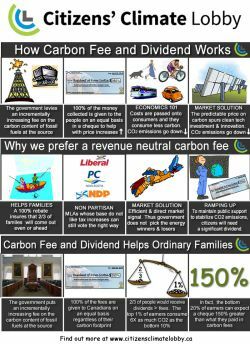 Carbon Fee and Dividend's "cheque prop" showing central feature--money returned to Nova Scotians from fees collected on pricing carbon. 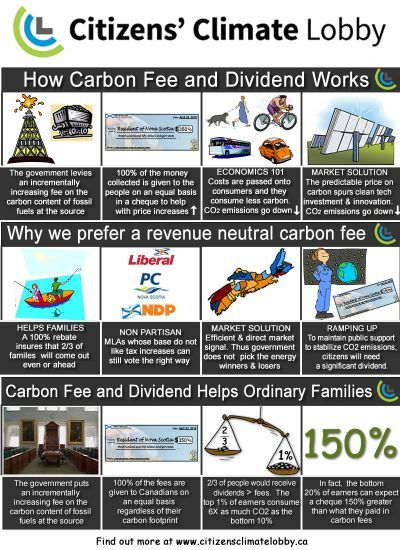 "The Story of Carbon Fee and Dividend" presented as an information graphic. IMAGINE Nova Scotia having a chance to be a world leader in global warming policy while taking a bite out of poverty! It's true and the notion came out on the table, sometimes as calm points gestured, other times as fists flying, when citizens commented, cooperated or clashed at the January 21st public meeting for tax reform. 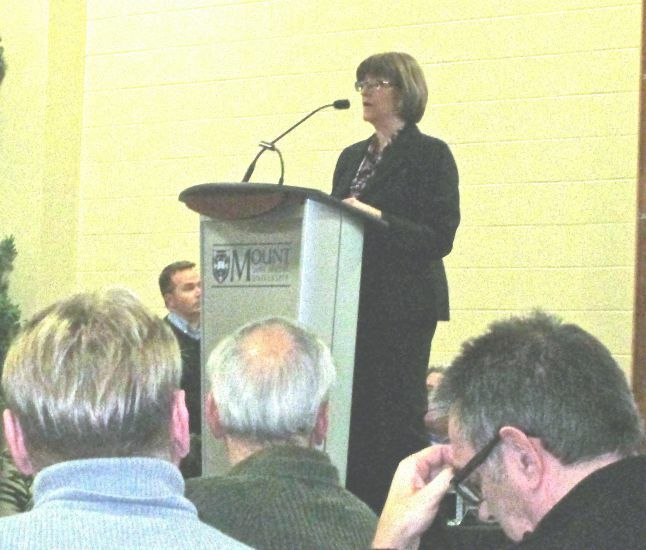 In a large convention style room at Mount Saint Vincent University, filled to overflowing, citizens of all ages, backgrounds and lobby groups convened to debate carbon pricing among other themes and to listen to finance minister, the Honourable Diana Whalen outline the government's current status concerning the recent release of The Broten Report on the need for Nova Scotia tax reform. The evening was largely an informal meet and greet between policy makers from the finance, environment and various other departments and the public, made up of representatives from such groups as the Ecology Action Centre, Citizens' Climate Lobby Halifax, the Canadian Centre for Policy Alternatives, the Affordable Energy Coalition, Mount Saint Vincent Social Science Faculties and many other uniidentified lobbies. 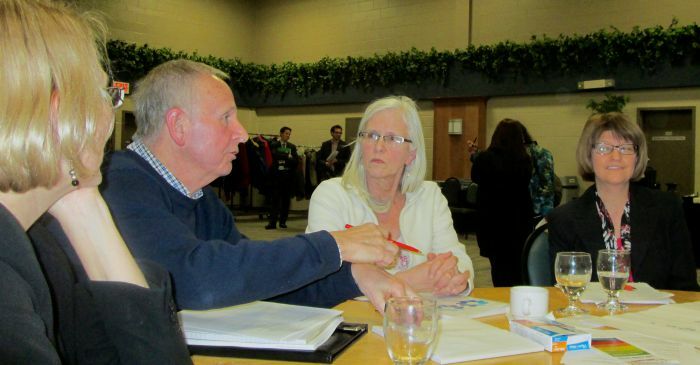 Individual citizens representing small business and private household concerns and four MLAs were also present. SIx citizens from the local group of the non-profit international organization, "Citizens' Climate Lobby" put their 'prop cheques' payable to "Residents of Nova Scotia" and a colourful infographic cartoon strip showing the advantage of a carbon fee and dividend by the plate of chocolate chip cookies the government provided to the citizens. Citizens depleted both supplies by night's end. This progressive approach to putting a price on pollution is proving to be sweeter than most as it is the simplest, least expensive and fairest design, eliminating the need for an expensive bureaucracy; sparing the middle class and protecting the lower income households. Whereas the B.C. Carbon Tax works by reducing corporate and individual income tax (which doesn't benefit the low income households very much), Carbon tax (fee) and dividend provides quarterly rebate cheques that increase annually as the price on carbon increases. This similarly would enable our province to reduce carbon emission levels as B.C. has done in the last five years to the tune of 15%. Carbon fee and dividend also enables wealthier Nova Scotians to contribute to the most pressing problem of our time. As did U.S. billionaire, Warren Buffett said to the American government, "Tax me!" for example, I believe a majority of more affluent citizens want to do their part for environmental and social justice. "The CTD proposal is straightforward. All the revenue from a carbon tax should be refunded to the people of Nova Scotia as an equal cash dividend. In the first year, the amount of the dividend could be calculated based on forecast revenues, but in each subsequent year the annual dividend per person would be equal to the total carbon tax collected last year, divided by the total population of the province. If paid as a quarterly cheque, it would add a small bit to the dependable monthly cash flow of families – a family of 4 in 2019-20 would get cheques totalling $948. However, an alternative possible delivery mechanism, with somewhat lower administrative and mailing costs, would be to integrate the CTD as a refundable tax credit within the Nova Scotia income tax system. Since the CTD would be defined as taxable income, the net benefit would be greatest for low income groups and income tax payable on it would be available for other government services. Assuming income tax, at the margin, yields approximately 30% of income increments, the positive impact on public revenues would be initially approximately $24M, rising to approximately $70M. Although the Broten Report did not provide any details on its methodology, it did give an estimate of the dollar impact of the tax, set at various levels, at each level of taxpayer income which gives the dollar value of tax paid by income level. It is straightforward to compare with the corresponding per capita CTD payment. The vast majority of taxpayers will on average come out ahead (approximately 75% of family units in Nova Scotia have total incomes of $80,000 or less). However, Nova Scotians with higher incomes will on average pay more in tax than they will receive in CTD dividend, and the progressivity in net payments is enhanced by the progressive structure of income taxation of the CTD payment. Although a tax on the carbon content of energy used would enhance the environmental sustainability of Nova Scotia’s future, it would not be fair to put the burden mainly on lower income and middle class Nova Scotians. Because lower income families spend a higher percentage of their household incomes on carbon based energy than more affluent families do, a tax on the carbon content of energy will, on the revenue side, be regressive – fairness depends crucially on the way in which carbon tax revenues are spent. Currently, business-oriented groups (like Eco-Fiscal) want the revenues from carbon taxation to be offset by vaguely specified corporate and income tax cuts which many suspect would primarily benefit the affluent, while environmental groups protest that carbon tax revenues should only be spent for environmental purposes. Neither of these groups of advocates of carbon taxation appear to care much about its regressive impact on lower and middle income families. But lower and middle income Canadians have seen their real incomes stagnate for several decades now. They feel increasingly pressured financially and they are understandably mistrustful of promises that a new tax which visibly adds to their day to day cost of living will be somehow offset by invisible benefits sometime in the future. Unless there is a clear way of counteracting the argument, a carbon tax proposal will always be vulnerable to the Harper government’s message that it is an attack on “the hard working Canadian middle class”. The CTD proposal is a straightforward way of showing this is wrong--the CTD would improve both environmental sustainability and economic fairness." 2 The CTD payable to children would be paid to their parent or guardian on their behalf. Negotiations with the federal government would be necessary to return to Nova Scotia any federal income taxcollected on the CTD. AS IT STANDS, THE BROTEN REPORT doesn't protect the low income households because it recommends removing the energy rebate AND incurring a carbon tax. It is clear from listening to volunteer workers such as the Canning food bank coordinator on CBC’s Information Morning recently, who speaks from the front line of poverty, that the working poor and the fatigued and frustrated volunteers trying desperately to assuage this overwhelming and ever increasing disaster of not being able to “eat AND heat” that everyone here needs a break. Carbon fee and dividend would provide a small break, as Dr. Osberg explains. IMPLEMENTING CARBON FEE AND DIVIDEND IS AN AMAZING OPPORTUNITY SITTING SQUARELY IN THE PREMIER'S LAP. Our province could be first out of the gate to make this happen. If the dividend aspect is publicized properly through Stephen McNeil's governance, Nova Scotians, a caring and empathetic people, will welcome it and the world will be at our door hoping to copy our leadership. Stephen McNeil has told Nova Scotians we need to tighten our belts. We've done so and many of us have met the Kyoto accord's requirement to reduce our energy use to boot. Now it's the premier's turn to lead Nova Scotians to becoming the first political region in the world to implement this amazing and simple strategy that will see every household receive four cheques a year to offset the small increase in fossil fuel cost that the fee would cause. What better time to do this with oil and gas at such a relatively low cost. Six cents a litre is not going to harm consumers and it will do a small bit to discourage people from returning to buying gas guzzling autos and burning more fuel. Remember, we're supposed to be tightening our belts. The government public relations' experts can sell this to the populace by focusing on the rebate reward and leading us to see that this will be an example for the world as a way to move to a low carbon economy gradually but surely giving our grandchildren a better future in a more livable world. WE must put one and one together to make two: we have to keep temperatures below two degrees rise and recent research shows that this means we must leave a good deal of the remaining fossil fuels in the ground. 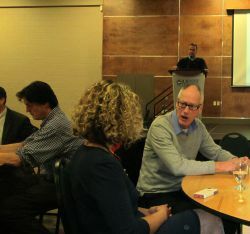 THe CONVERSATION AMONG NOVA SCOTIANS CONTINUES as FInance Minister Whalen sets out to receive input in seven other regions of the province. If the results of the Halifax session are an indication, the desire for a carbon pricing is real in Nova Scotians' minds and the academic opinion and research carried out by groups like Citizens Climate Lobby's REMI Report point to a fee and dividend plan as the best option. Let's do it, Nova Scotia!